What comes next in Marketing on the Smart Web. Philip Caines is a Vancouver based travel blogger with insight into aggregating the long tail of travel. RezGo provides technology solutions to smaller tourism service providers. Excellent stuff on what's happening on the web. Writer, consultant, marketing executive, surfer. For the past months I have been posting all my comments on two blogs, both this one, originally started back in 2005 and my newer effort Marketing on the Smart Web which now has become my main blog. If you have been visiting this site or bookmarked it, please switch over. I hope you will continue to follow my commentary and find it thought provoking and interesting. 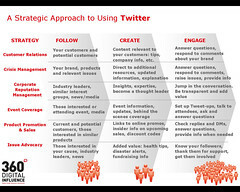 This approach outlined by 360º Digital makes a lot of sense to me and is simple and straight forward. Companies could do much worse than follow this advice. No doubt, many surely will not heed it which could result in Twitter losing it's present appeal as an easy to use and effective communication tool. I found this a very easy to understand presentation about what for the mainstream still remains somewhat of a mystery - The Semantic Web. reports Springwise in their latest trends newsletter. YokMoK, a Spanish adventure travel operator came up with this idea and it seems to me a great example of customer involvement in product planning. At the same time it offers these past travelers a reward for recruiting others to travel with the company. Knowing how influential recommendations by friends are in the choice of travel products and destinations this looks like an effective way to take advantage of this and also get useful word-of-mouth support. Should be a model to be copied more widely. Will Old Travel Strike Back? As the worlds of technology and media collide, the same contest keeps getting played out over and over again: lumbering old-media companies take on nimble new-media upstarts, and usually the new-media guys win, since it's easier for them to figure out the content business than it is for the content companies to figure out the techie stuff involved in launching an Internet business. We can replace "media" with "travel" and come to pretty much the same conclusion. Twelve or so years ago when the web first started to impact business, it was the new outsider tech start-ups like Expedia and Priceline that pioneered online travel. It was way before any of the traditional travel industry players entered the fray. The same was true in Europe and Asia. It was again the case a few years ago, when travel 2.0 - the phase we're presently in with online travel research and planning moving online - was ushered in not by the OTAs, the traditional tour operators or destination marketing organizations (DMO) but start-up companies like Uptake, Tripbase, Travelmuse, Triporati and others. This seems to confirm how hard it is for established companies to break out of the status quo, innovate and, if necessary, change business models. While this might be understandable, what I do not understand why there are not more ventures where these new players are being sought out by the traditionalists to cooperate. This is especially true for DMOs who do not have to fear being a competitor to these companies but a potential partner. The only thing they need to fear is becoming irrelevant in a few years time by not being innovative enough and have their role being assumed more and more by the new disruptors and innovators. according to Tim Berners-Lee in Outside the Lines - CNET News and although the article was published last year, it still contains great examples of some of the features the smart web will bring. TBL is a true visionary, and one with a great track record of delivering on his ideas so this is not just idle speculation. The comments by Google's director of research are very revealing too. Will it really take 50 years for intelligent digital intermediaries to become a reality? Who knows, maybe less. What's clear, is that the implications for the travel industry will be significant and transforming as we slowly but surely move forward with new technology developments that will make it happen. Exciting stuff! Great post by Kevin Kelly on his blog The Technium: Two Strands of Connectionsim The chart visualizes in a compelling way the space we're in right now and the path forward which is often described as the semantic web or web 3.0 and what will happen beyond as the web continues to evolve. This has been the undercurrent to my blog and I'm curious and fascinated to discover how all this will affect the travel industry over the coming years, as it certainly will. is the title of a recent blog post by Seth Godin and as usual, when I read Godin, I start to think, I can't help it! He talks about marketing not being the same as, but much more than, advertising, which I thought everyone would know by now but it seems some people apparently still don't. To get back to the question, the product obviously comes after marketing and he cites the example of the Prius. Now, this gets me to the issue at hand, namely that destination marketing is one of the hardest disciplines in marketing! Why, you ask? Because in almost all cases - Dubai being one well known exception - the "product" is a given. The destination exists, often has for decades or centuries or more and can't be significantly changed to suit the marketer. You play the hand your dealt and that's why it's more challenging than the so often hyped packaged goods marketing for example, or vehicles or almost any product. If research shows that your soap has to smell a certain way, be a certain color and shape your product guys will produce and deliver it that way. Try that with your resort, well maybe you can add or improve some infrastructure but it essence you're still left with the given basics. So, destination marketing experts should really be the ones who get the accolades and I wonder why they so often aren't. Just watch how many marketers from the DMO world cross over to other industries based on their track record and compare that with the reverse. You'll be surprised at the imbalance. What I've noticed over the years, is that a large number who face the challenge of destination marketing leave the industry after a few years. What's this got to do with the web, you ask? Well, similar principles apply when you hire a web marketer or an interactive agency. It pays to check if they truly understand the particular challenges they face and whether they have the right experience or not. The Technology is "Linked Data"
It's not the first time I've had this paradigm-shift problem. Early on, people really didn't understand why the Web was interesting. They saw it in the smaller scale, and it's not interesting in the smaller scale. Same thing with the Semantic Web. Having followed this subject for some time now, I tend to agree with his description. Let's see how long it will take for this situation to improve and for more people to catch on to the facts that significant change will happen as this next phase becomes mainstream. dissertation project writing on This blog has moved! dissertation papers help on This blog has moved! sac longchamp pas cher on Congrats to the Brits!